College presidents are adept at using multiple forms of technology. They have high rates of access to technology, with 91% of presidents reporting they use a laptop computer at least occasionally, 88% saying they use a smartphone and 87% saying they use a desktop computer. They are also early adopters of new technologies such as tablet computers and e-readers. 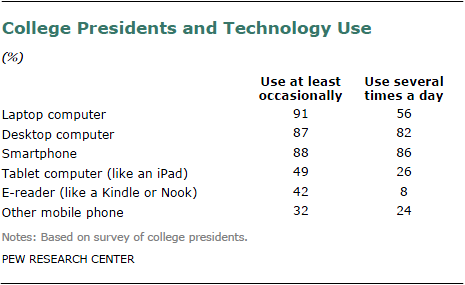 Roughly half of the college presidents surveyed (49%) report that they use a tablet computer (such as an iPad) at least occasionally, and 42% use an electronic book device (such as a Kindle or Nook). Just under one-third of presidents (32%) report using a mobile phone that is not a smartphone on at least an occasional basis. College presidents employ multiple forms of technology (laptop and desktop computers, smartphones and other cell phones) to varying degrees on a daily basis. Presidents most often rely on smartphones, with 86% using them several times a day. Desktop computers are the second most often used technology, with 82% of presidents using them several times a day, a third higher than laptops (56%). One-in-four (24%) report that they use other mobile phones several times a day. Roughly one-quarter (26%) of the college presidents surveyed say they use a tablet computer several times a day. Nearly one-in-ten (8%) use an e-reader this often. Compared with the general public, college presidents are proving to be early adopters of many of these new technologies. According to a 2011 survey conducted by the Pew Internet & American Life Project, 12% of all adults had an e-reader such as a Kindle or Nook. This compares with 42% of college presidents who report using such a device at least occasionally.9 Similarly, while only 8% of the general public report having a tablet computer such as an iPad, 49% of college presidents use this type of technology at least occasionally. Many college presidents are also utilizing social media outlets such as Facebook and Twitter. Fully half of those surveyed say they use Facebook at least occasionally, with 18% saying they use it every day. Nearly one-in-five (18%) say they use Twitter at least occasionally. College presidents may be slightly ahead of the general public in their use of Facebook and Twitter. In the 2011 Pew Internet survey, 45% of all adults said they had used Facebook and 10% had used Twitter. However, college presidents lag behind or are on par with young adults in their use of social media. Among those ages 18-29, 74% use Facebook and 17% use Twitter. Technology use by college presidents is fairly consistent across different sectors of higher education. While the institutions may differ in the degree to which they have embraced online learning, their leaders are equally adept at using many of the newer technologies. Younger presidents (under age 50) are more likely than their older counterparts to use laptop computers at least daily. There are notable patterns by region as well. Presidents of colleges located in the East are less likely than their counterparts in other regions to use a smartphone daily. East Coasters also lag behind the rest of the country in Facebook adoption. While presidents of 50-55% of the colleges in the Midwest, South and West use Facebook at least occasionally, just 37% of East Coast presidents use the social network.